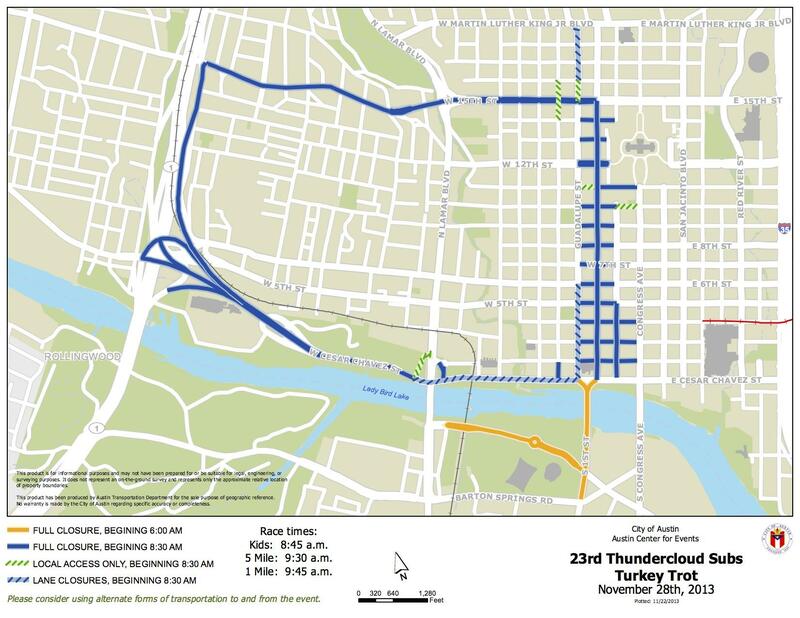 The 2009 ThunderCloud Subs Turkey Trot in downtown Austin. Even if you’re staying off the highway this Thanksgiving, your plans might still be affected by holiday schedules and street closures. 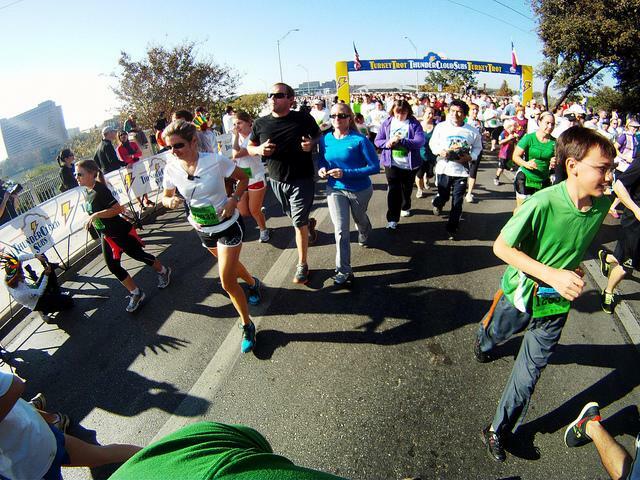 Public transportation routes and schedules will also be changed for Thanksgiving. Capital Metro will be operating Sunday-level bus service on Thanksgiving Day, and Saturday-level bus service on Friday. MetroRail, UT shuttles, Night Owl, and E-Bus service will be closed both days. Plan your route in advance using Capital Metro’s travel planner. City of Austin administrative offices and municipal facilities will be closed Nov. 28-29. Normal business hours will resume on Monday, Dec. 2. Trash pickup will “slide” one day for customers who normally have their trash picked up on Thursday or Friday. Pickup days will instead be moved to Friday and Saturday. The Austin Animal Center will close at 5 p.m. Wednesday and remain closed until Friday morning. Austin Public Libraries close at 6 p.m. on Wednesday and remain closed all day Thursday and Friday. Barton Springs Pool will remain open Thursday, but there are no lifeguards present. The Zilker Botanical Garden will be closed all day on Thursday. More information about city closures can be found here. Getting out of town this weekend to join relatives for Thanksgiving? Plan wisely – it’s one of the busiest travel days of the year. According to a report by AAA Texas, 3.4 million other Texans will also be traveling for the holidays. Most travelers will leave for their trip on Wednesday, Nov. 27 and return on Sunday, Dec. 1. For those going out of town, 3.1 million plan to travel by car. 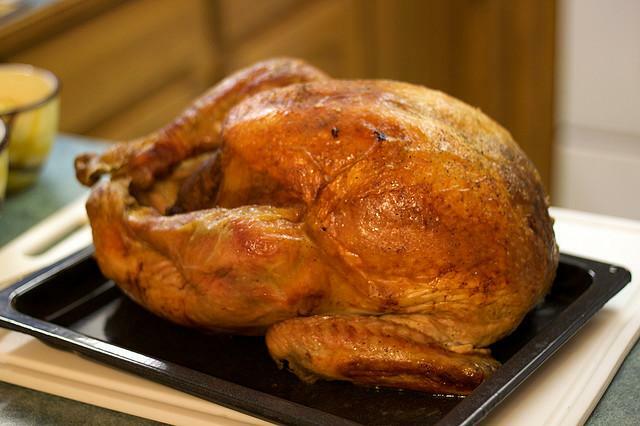 Should You Stuff Your Turkey For Thanksgiving? 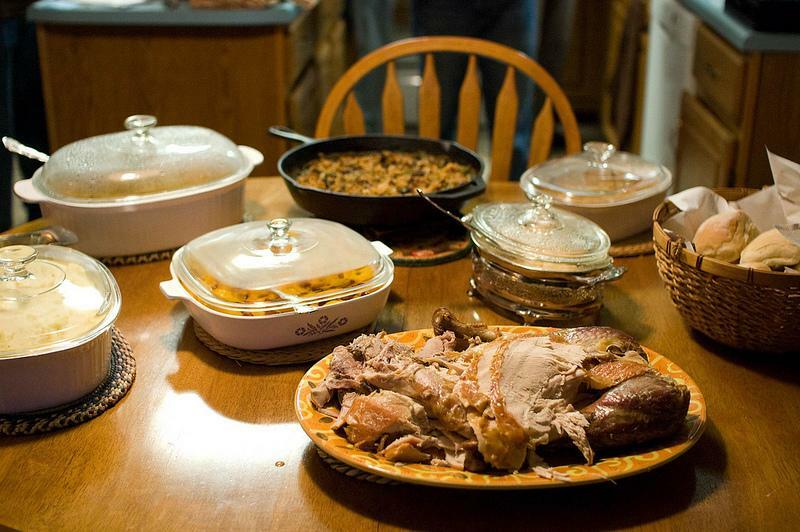 As Thanksgiving nears, attention turns to the kitchen. And as families across the country prepare their family meals for Thursday, a debate: whether to stuff the bird. Field & Feast is a weekly feature airing Saturdays on KUT and KUTX. On the Field & Feast website, Cecilia Nasti wades into the stuffing debate and offers the following advice on how to avert dressing disasters and other Thanksgiving goofs. What’s turkey without stuffing? That wonderful bready filling, saturated with the savory juices of your holiday bird is heaven – that is, until it makes someone sick. The challenges of cooking a stuffed bird is getting the stuffing to reach the food safe temperature of the cooked turkey: 165° F.